Arthritis, hip dysplasia and other joint problems are extremely common in dogs. Large dog breeds and senior dogs, those over the age of seven, are especially prone to developing these issues. Joint problems are extremely serious, as most of the damage done to your pet's joints cannot be reversed without extensive surgery. As such, it's necessary to help care for your dog's joints and to do so at an early age when the damage can still be prevented. Joint care can improve your pet's quality of life and can be particularly helpful for active dogs. In addition to ensuring that your pet stays at a healthy weight, it can also be essential to supplement your pet's diet with additional nutrients that promote healthy joints. Though this can be done with treats and special formulations of dog food, using a joint supplement can be integral to your joint care plan. One brand of joint supplement that is known for producing a quality product for dogs is Glyco Flex. Available in three different formulations for dogs of varying health, this product strives to provide all the nutrients known to benefit joint health. These treats work great- but anyone seeking to start their pet on a new supplement, treat, or food formula should know how it works to ensure that it's a proper fit. What is Glyco Flex and How Does It Work? Glyco Flex is a supplement that comes in tablets or soft chews that aims to treat joint pain and joint degeneration in dogs with glucosamine, DMG, and other vitamins and minerals that are vital to the natural processes of cartilage and synovial fluid production. Synovial fluid lubricates joints and cartilage composes them- meaning that both directly impact the health of your dog's joints. Though Glyco Flex I and Glyco Flex II are rather basic formulas for joitn supplements, with only the latter containing the beneficial ingredient methylsulfonylmethane (MSM), Glyco Flex III is meant for dogs in need of advanced joint care. All three formulas are considered chondroprotective agents, meaning that they are substances which reduce inflammation of the joints, increase lubrication of joints, and affect enzymes that can damage cartilage. All chondroprotective agents are derived from one of several natural resources that each work in the same way. This means that agents with these properties share the risk of exhibiting certain adverse reactions. The side effects associated with chondroprotective agents are generally limited to cases of a deviation from the appropriate dosage. Excessively large doses of these supplements can result in an array of symptoms related to digestive distress. Dogs that ingest these agents in excess can experience nausea, lack of appetite, and loose stools- though dogs suffering from diabetes face additional risk. In diabetic dogs, these agents can raise blood sugar such that their use of these agents should be limited to times in which it’s possible to closely monitor blood sugar levels. Lastly, chondroprotective agents should not be used in conjunction with blood-thinning medication, as the combination can cause bleeding. Though these side effects can seem serious, proper and cautious use of chondroprotective agents should warrant no ill effects. 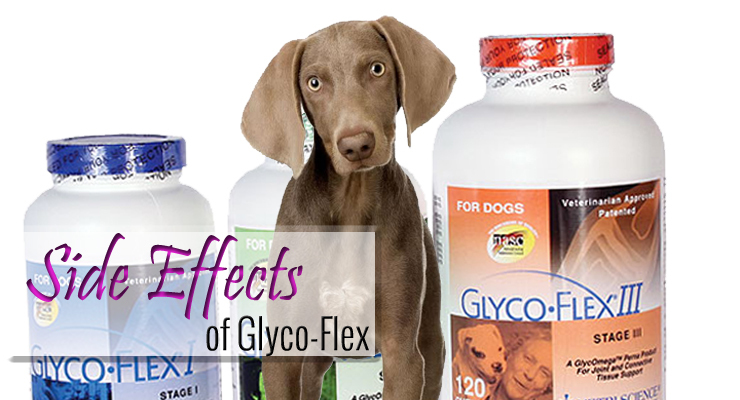 If you want to start your dog on Glyco Flex or another joint supplement, it can be useful to speak with your veterinarian, especially if your dog is taking any other medication or if he suffers from diabetes. This is particularly the case with older dogs, as they are more prone to both arthritis and diabetes mellitus. We hope that this article has helped you select the appropriate joint supplement for your pet and eased your concerns regarding possible side effects. For more information on Glyco Flex and other joint supplements for dogs, check out this article on the subject or these reviews from real customers.